Happy Meal | I'm not stalking you. 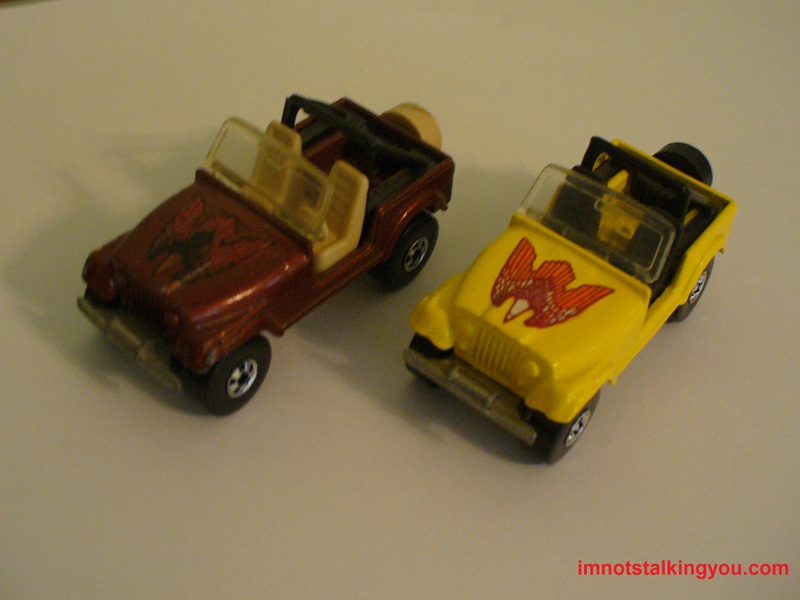 I have two Hot Wheels Jeeps I have had since I was a kid. One I got from McDonald’s in a Happy Meal. (Mmm…McDonald’s.) The other I got from sending in UPCs from Frosted Flakes. The brown one is almost the same as the one that used to sit outside the bowling alley. I have a Jeep hoodie I bought several years ago. But it is too big, so I hardly ever wear it. 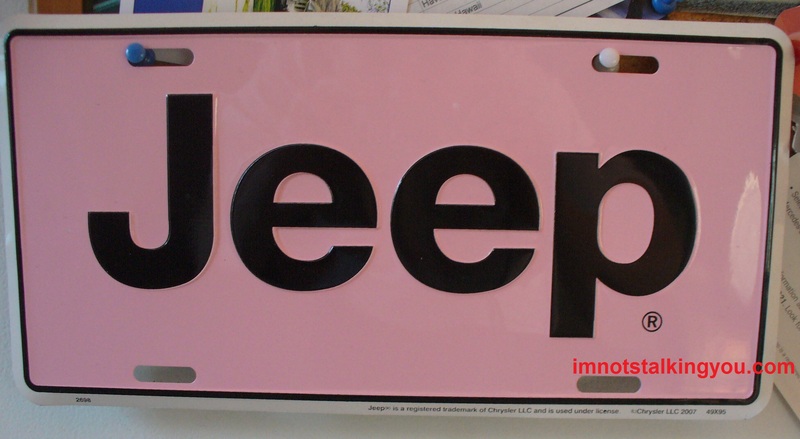 I also have a pink Jeep license plate I bought to put on my Jeep. That I do not have yet. I rode in a Jeep once. It belonged to my cousin. I was in the backseat. I was too young to really remember much about the ride. 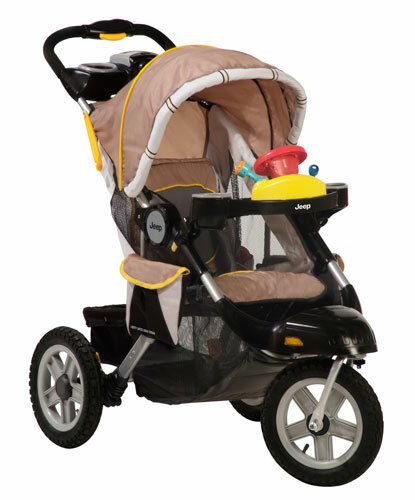 My husband always wants me to test drive one. But I always decline. If I test drove a Jeep and I didn’t like the ride, I would be heartbroken. If I test drove a Jeep and loved it, I would be in misery because we do not currently have the funds to buy one. So, a test drive is a lose, lose proposition right now. 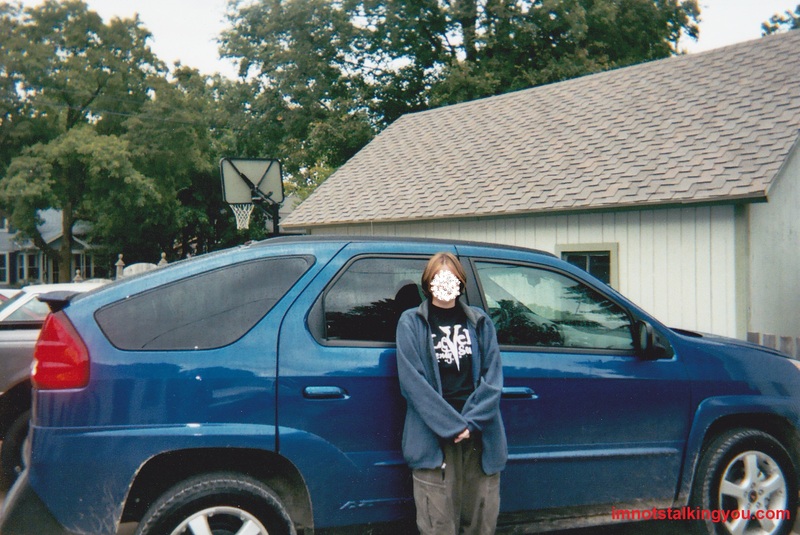 Me & my Aztek when it was brand new, before all the miles and hail damage. I have cool black and highlighted hair in this pic. “Tell me more about your dream car,” you say? 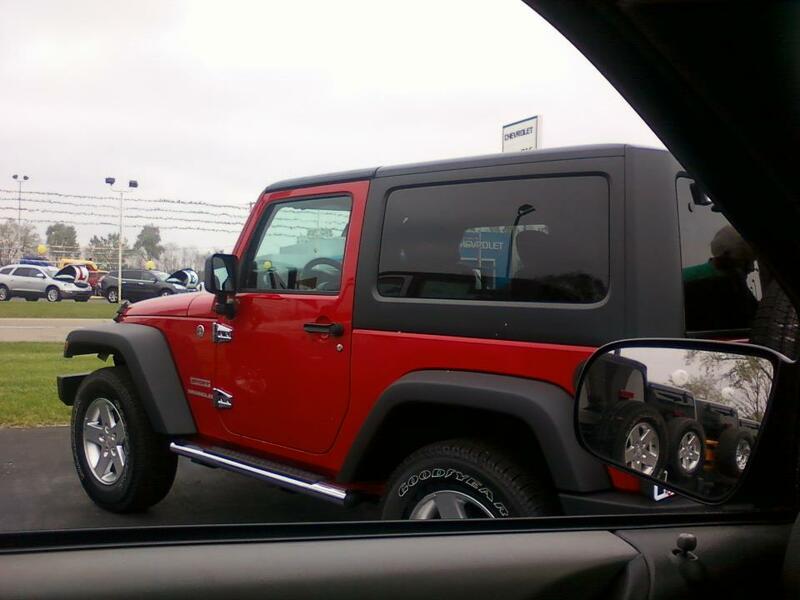 I want a red Jeep Wrangler hard-top 2 door with automatic transmission, 4X4, fog lights, and an mp3 plug-in. I know a four door would be more practical. But not on my bank account. And it destroys the classic Jeep look I have found so darn appealing for so many years. I plan to drive it forever. And when the red paint starts to peel or not, I will have it custom painted in pink camouflage. How sweet would that be? Then it would totally match my Jeep license plate. The one downside to owning a Jeep will be my husband. He likes to take things apart. Everything. So, I know there will come a day when I am like “Honey, it is raining outside. I need to go somewhere. I really need you to put the doors back on my car for me.” But I will smile when that day comes. Because that will mean that I finally have my Jeep I have always dreamed of. Posted in A day in the life and tagged 000, 200, Aztek, C-J, Dukes of Hazzard, Happy Meal, hard top, hoodie, Hot Wheels, Jeep, Kellogg's, license plate, McDonald's, miles, Mork & Mindy, Pontiac, stroller, Sunfire, Wrangler. Bookmark the permalink.